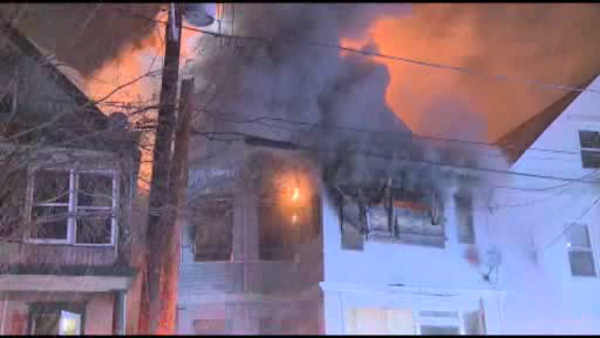 ORANGE, New Jersey (WABC) -- A three-alarm fire tore through an abandoned home early Saturday in New Jersey, displacing over a dozen nearby residents whose homes were damaged. The initial call was received at 2:45 a.m., and flames and smoke were seen coming out of the roof of the house on Chapman Street in Orange. As the flames kicked up, the fire jumped to a neighbor's home. Frigid temperatures and snow made it that much more difficult for firefighters to battle the flames. The fire was under control in one hour. No civilians were injured but one firefighter received minor injuries from a slip and fall. The New Jersey Red Cross assisted two families impacted by the fire. A total of 16 people are being assisted with temporary lodging, clothing, food, and financial services.